Immerse yourself in the culinary world of the Lounge, with bistro cuisine and a focus on great produce. Our chef Sylvain Embarek is committed to working with local producers to develop balanced dishes. Welcome to the heart of the most contemporary district in Paris. We are pleased to welcome you to a friendly and intimate setting in La Défense. We offer you a unique travel experience thanks to our 5-star service. Life is Magnifique in Paris.. Experience "Sofitel art de vivre" in vast rooms and suites with contemporary amenities. Wander through the boutiques of the largest shopping center in Europe, open seven days a week. With the Champs-Élysées and Arc de Triomphe nearby, the City of Lights is on your doorstep. Each Sofitel is a unique blend of the French art de vivre and local refinement. 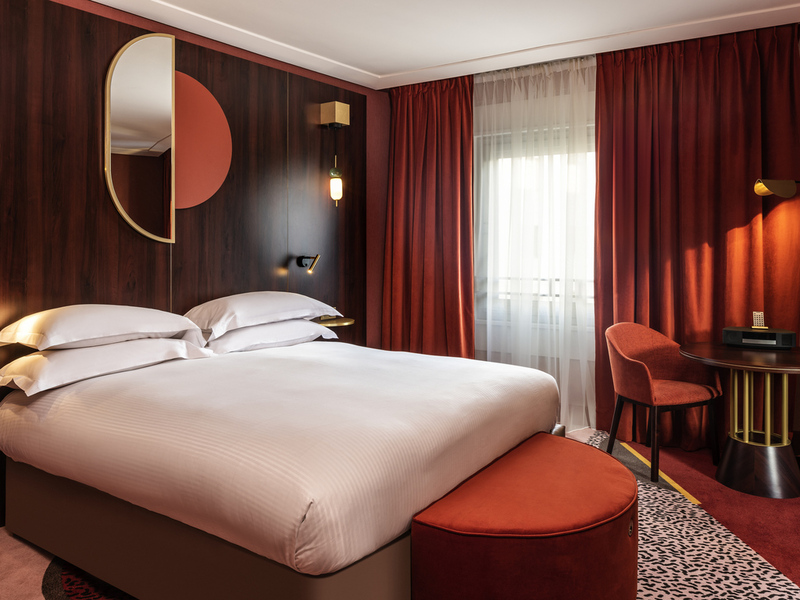 Discover the 5-star services and amenities of Sofitel Paris La Défense, a luxury hotel that blends minimalist lines and soft tones with splashes of vibrant color. 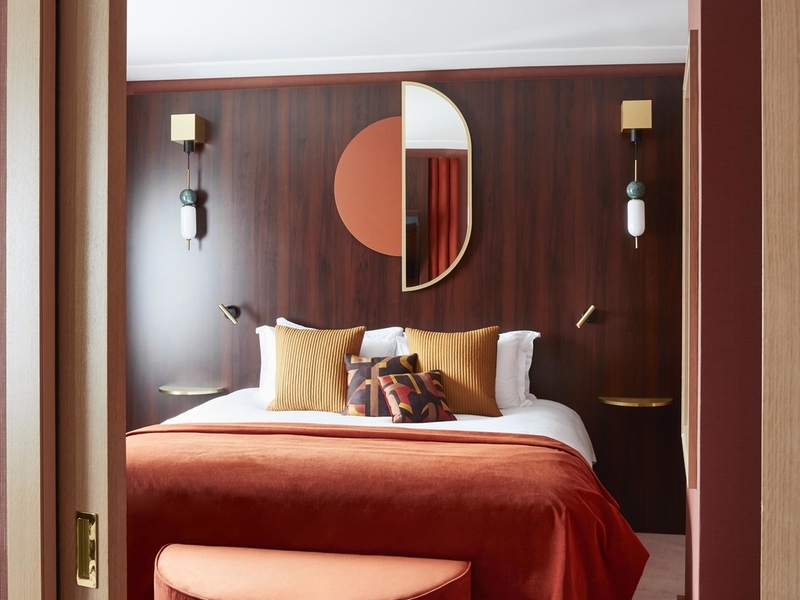 With artwork by Ruddy Candillon and interior design by Jean-Philippe Nuel, your luxury hotel pays tribute to the capital's business district - symbolic of 50 years of cultural dynamism in a city that is always ready to reinvent itself. After an excellent night's sleep in the divine comfort of your Sofitel MyBed, we invite you to start your day of sightseeing or business meetings with breakfast in Le Lounge, underneath its exquisite glass roof. 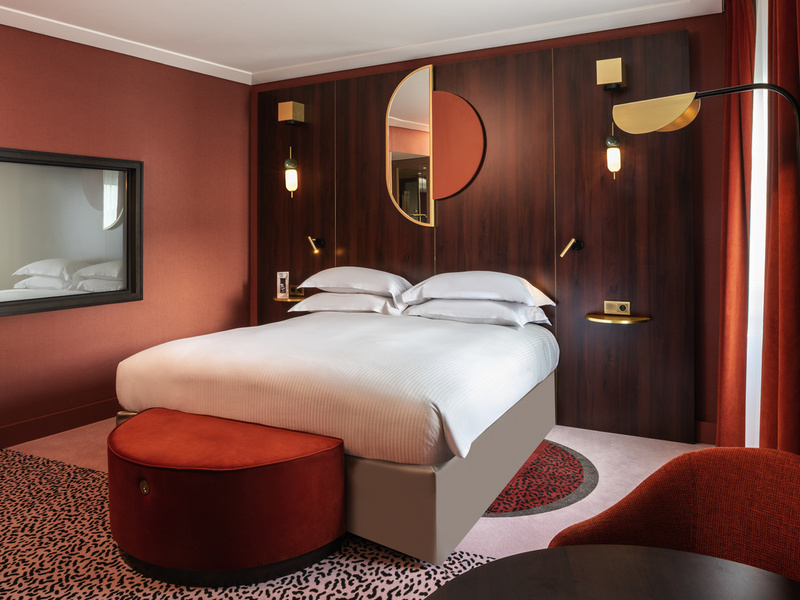 At the heart of the capital's modern business district, the timeless magic of Paris is never far. From the Louvre and the Saint-Martin canal to glamorous department stores and designer boutiques, discover a metropolis that never ceases to amaze. 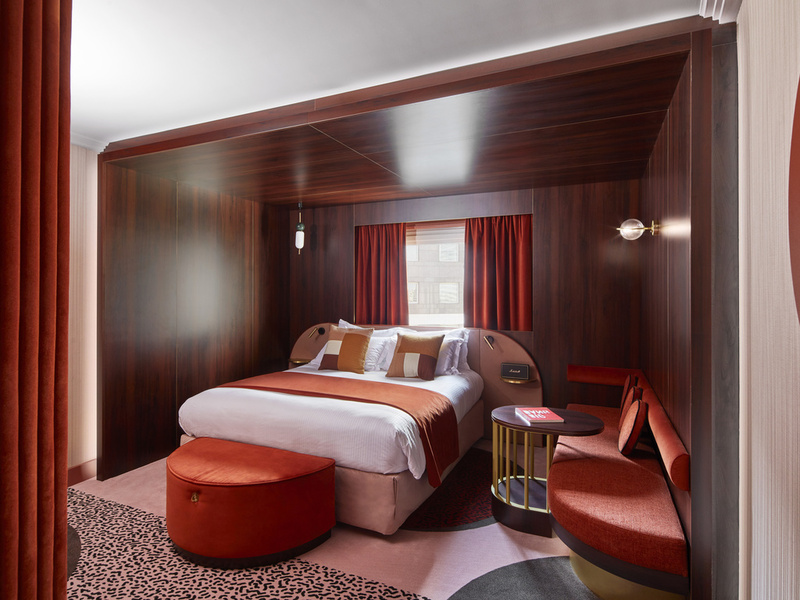 Dressed like a chic businesswoman with fine-striped curtains lined in silky fuchsia, these 16 suites (15 Junior, 1 Prestige) have contemporary lounges with Malongo espresso makers and DVDs. 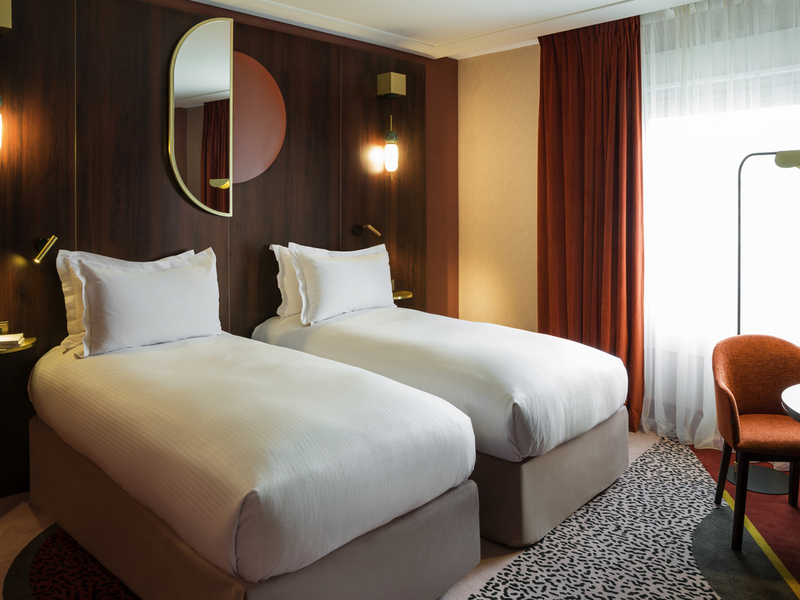 Treat yourself with exclusive La Défense accommodation. 258 sq. ft. (24 m²), free WIFI, exclusive Mybed bedding, opening window, minibar, tea and coffee making facilities, 48" HD TV, Apple TV, Bose speaker, safe, bathtub, Hermès products. Connecting rooms and twin beds available on request. 280 sq. ft. (26 m²), free WIFI, exclusive Mybed bedding, opening window, minibar, tea and coffee making facilities, 48" HD TV, Apple TV, Bose speaker, safe, rain shower, Hermès products. Connecting rooms available on request. 301 sq. ft. (28 m²), free WIFI, exclusive Mybed bedding, opening window, minibar, Nespresso machine, 48" HD TV, Apple TV, Bose speaker, safe, bathtub and separate shower, Hermès products, gym kit. Twin beds available on request. 377 sq. ft. (35 m²), contemporary design, lounge area, free WIFI, exclusive Mybed bedding, opening window, minibar, Nespresso machine, 55" HD TV, Apple TV, Bose speaker, safe, bathtub and separate shower, Hermès products, gym kit. 710 sq. ft. (66 m²), contemporary design, separate bedroom and lounge, exclusive Mybed bedding, opening window, minibar, Nespresso machine, 55" HD TV, home cinema, Apple TV, Bose speaker, safe, separate bath and shower, Hermès products. Refined bistro cuisine and contemporary design are what set the Lounge apart from other restaurants in La Défense. Get together for a business lunch or dinner with friends under the glass ceiling of this restaurant. Freshly made cocktails, cozy decor and lounge music - perfect for post-work relaxation. See the incredible range of vodkas lined up along the gleaming red mirror of this bar in La Défense. The InspiredMeetings advisors at our La Défense corporate hotel will help to organize your event in Paris. Our four spacious and modular meeting rooms can accommodate up to 70 people. Benefit from the experience of the InspiredMeetings concierge assigned to your project. He or she will ensure the smooth running of your meeting, conference or seminar in Paris and suggest innovative team-building activities. Great dining options from the Lounge: delicious olive cake, cheesecake or banquet at La Tavola. 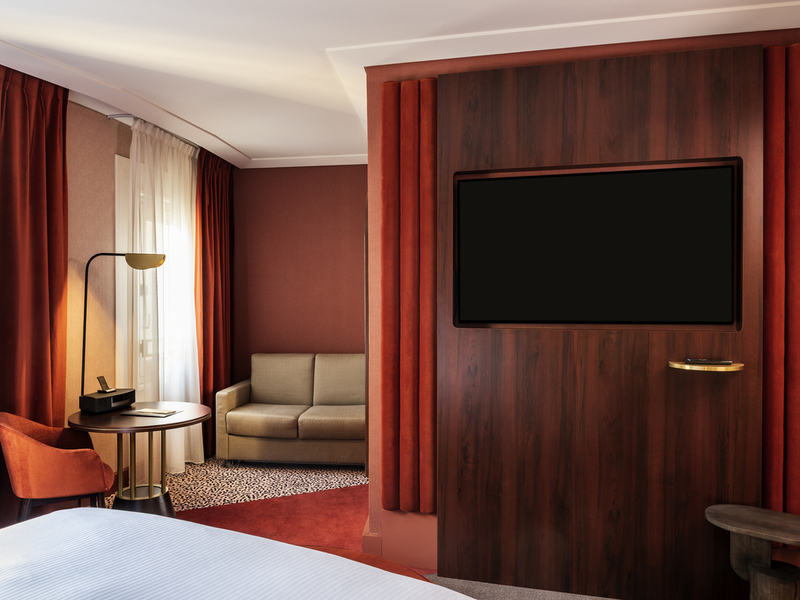 Make the most of our business center, free WIFI access and state-of-the-art audiovisual systems at this La Défense hotel. Personal service by friendly, multilingual staff is at the heart of our philosophy; ask about WiFi, massages, babysitting, pets, dry cleaning, valet parking, jogging routes and more. A fitness center offers cardio machines and weights. Despite your busy schedule in La Défense, fitness regimes needn't slip. Our fresh, bright hotel fitness center boasts modern cardio machines, weights. If you prefer the outdoors, special jogging tracks are available. Massage service on request.